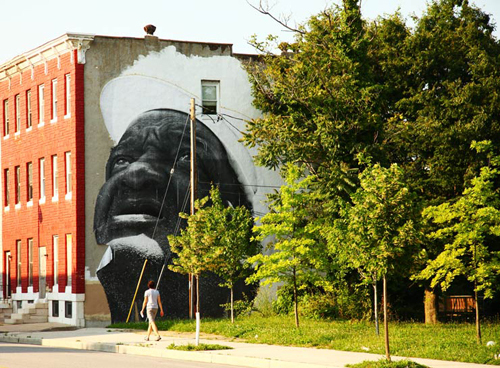 Those familiar with Baltimore know it’s a vibrant city; there’s always more going on than meets the eye. Dive bars, little-known hotspots and a very clustered, main-street, neighborhood feel can make sections of Baltimore seem emptier than they really are. 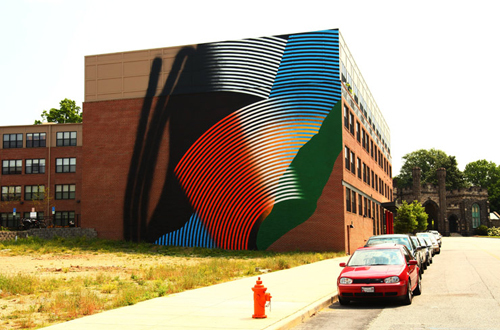 A recent series of murals looks to change that perception by bringing some of the color that every Baltimorean is familiar with to the surface. 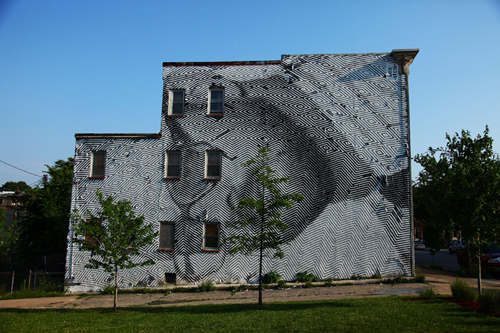 The Open Walls Project, a collaboration of artists from around the world, is aimed at using murals as a means to enliven and revitalize communities. Below is a map showing the relatively large section of central Baltimore that the Open Walls Project has chosen to cover including the neighborhoods of Station North and Greenmount West. Station North, the area just north of Penn Station, from which is draws its name, and Greenmount West are two neighborhoods that are physically very close to one another with Greenmount West lying just to the east of Station North. Despite their proximity, they find themselves at slightly different points in the revitalization process. Though both have seen a turnaround recently, Station North, due to its central location and proximity to Penn Station, has seen more investment than its eastern neighbor. 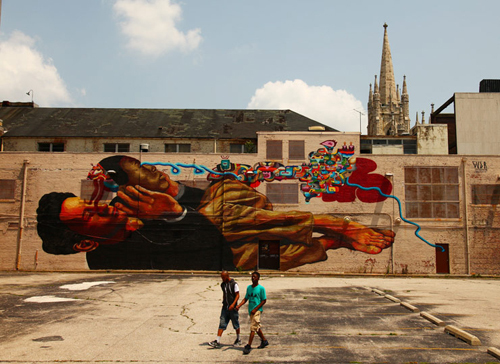 But art, it would seem, is undeterred by the vacant homes and lack of investment east of Guilford Avenue. 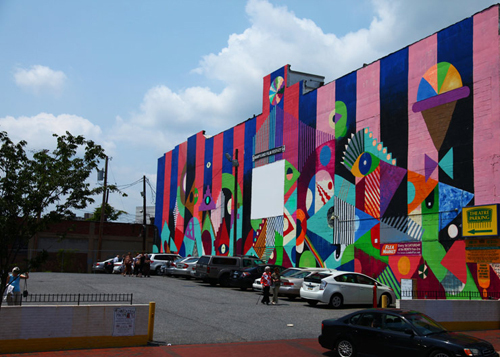 In fact, many of the murals are in Greenmount West. Some are even on the sides of homes that stand in the middle of what used to be a proud block. Due to disinvestment and blight, some properties have been demolished leaving windowless walls facing vacant lots and street corners. 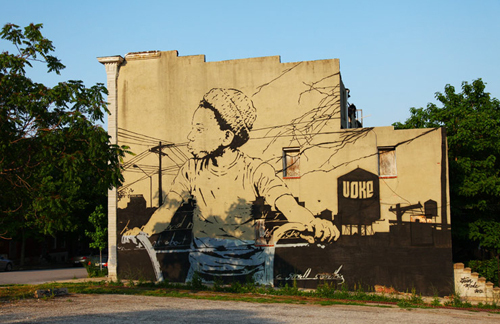 This problem plagues many of Baltimores neighborhoods but, hopefully, the addition of art to the Greenmount West’s corners can help fill the void left by vacant houses and empty storefronts. 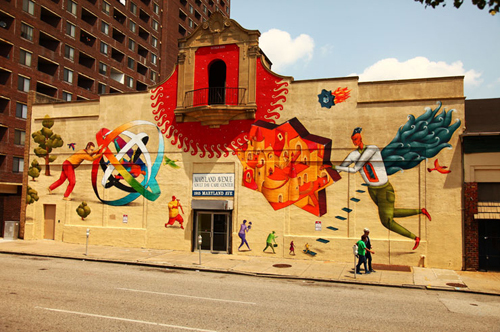 A mural on the wall of the City Arts apartment building at the corner of Greenmount Ave and Oliver St. – City Arts has been nationally recognized for providing affordable housing to artists and other Baltimore residents. Facing Charles Street just north of North Ave.
More murals can be seen in an article in the Huffington Post on the Open Walls Baltimore project. What is the Jones Falls, an expressway or a stream? The answer probably depends on who you ask. Sadly, the Jones Falls has been branded as an expressway. We hear it every day on TV and radio traffic reports and it doesn’t help that over 100,000 vehicles and over 35,000 transit riders use the corridor it forms to get to work every day. In reality, the Jones Falls is not a thoroughfare, it’s a stream that runs from north to south through Baltimore meeting up with the Northwest Branch of the Patapsco River or Inner Harbor at its mouth. The Jones Falls Watershed comprises 58 square miles of urban and suburban Baltimore. The pink area on the map represents the Jones Falls watershed. The yellow area represents the Direct Harbor watershed and the blue section is the Gwynns Falls watershed. The ravine-like valley formed by the Jones Falls used to be a hub for mill activity. Industrial uses along the Jones Falls began disappearing when waterpower became a thing of the past. A bird's eye view of Penn Station and the Jones Falls prior to the construction of I-83 - the bridge in the foreground is the St. Paul Street bridge. It has since become a transit right of way that carries commuters into Baltimore via the Light Rail, Amtrak’s Northeast Corridor and the eponymous expressway. 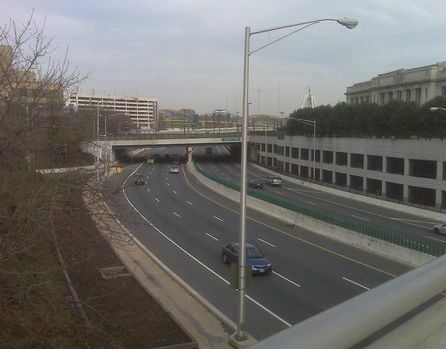 The Jones Falls Expressway, or JFX, was completed in the early 1960’s up to Guilford Avenue. The expressway follows the path of the Jones Falls for almost about 7 miles toward its southern end. The Jones Falls Trail, like the JFX, follows the stream and provides important recreational access for Baltimoreans living in the northern half of the city. However, starting just south of Penn Station, there is almost no public access to and no visibility of the stream itself. This is perhaps one of the largest issues that results from having a highway that follows and, in some cases, covers the stream. A visit to a park or other area where one can connect with the environment and see the importance of the stream ought to be more of a possibility. Unfortunately, the Jones Falls ends unceremoniously as a spillway, essentially eliminating public access to the stream as it becomes a concrete trough, designed to carry water efficiently to its outlet at the Inner Harbor. Despite comprising a relatively small portion of its total watershed, these final miles are perhaps the most important. 1.) The Jones Falls runs either underneath highways and roads or out of sight and out of mind. Exposing the Jones Falls to the public in Downtown Baltimore could go a long way toward creating a greater respect for Baltimore’s waterways. 2.) The population density increases fairly dramatically meaning a greater number of people have less access to the stream and may not be aware of the impact that littering and other forms of pollution have on the Inner Harbor, the Patapsco River and Chesapeake Bay. 3.) The amount of pervious land such as parks, lawns and fields (anything not covered in concrete or asphalt) decreases which amplifies the effect that pollutants have as they cannot be absorbed by or filtered through the soil and go directly into Baltimore’s Waterways. There are obviously more factors contributing to the overall pollution of the Inner Harbor and the Chesapeake Bay but a campaign to reconnect the Jones Falls to the downtown neighborhoods through which it runs could help turn this forgotten waterway into a cleaner one. The Jones Falls Expressway needs to be reinforced, rethought or torn down in the next ten years. The Infrastructurist, an infrastructure and urban design blog, ranked it as one of the most important highways to tear down. If the highway is to be removed, a new urban boulevard could solve a lot of problems that the elevated portion of the JFX has created. There is a tremendous opportunity to reincorporate the Jones Falls itself into Baltimore’s urban fabric, connect formerly divided neighborhoods and add options for parkland and transit. An excellent design option that is truly ambitious and goes far above and beyond many other proposals can be found here. 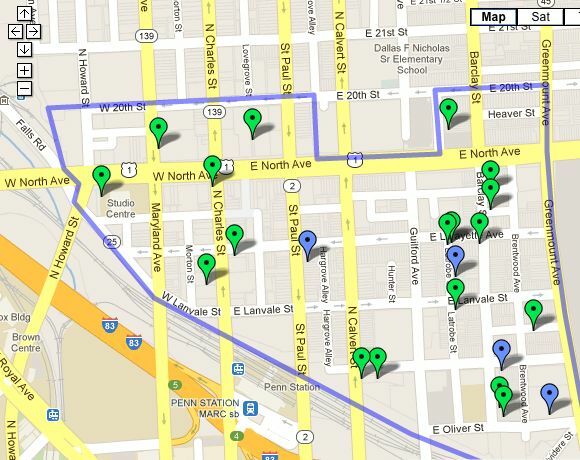 The entire proposal can be found on Envision Baltimore’s Blog. 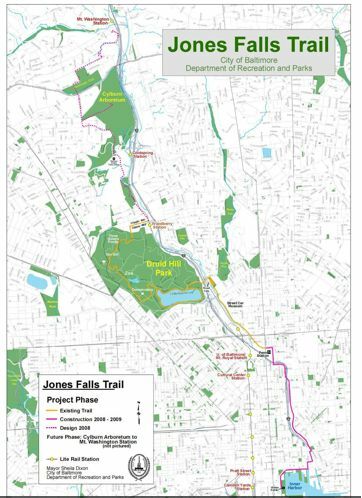 The proposal, by Marc Szarkowski, would promote access to the Jones Falls, provide for a bike-able corridor and a transit friendly one, presenting alternatives to automotive use. Though definitely far from a reality, this proposal would make central Baltimore into a much more beautiful urban environment.